"We've all read about the high rollers who go boom and bust, but this book is different. Packed with straightforward prose, practical knowledge and honest counsel, Diary of a Professional Commodity Trader delivers far more than the title promises. Peter Brandt methodically explains what no one has before: how a dedicated individual can trade for a living. If that is your destination, this is your ticket. " "This book is insanely great. The refreshing clarity this book brings to the table is brilliant. I think this is an amazing, excellent book, one that could help a whole new generation of traders." "This is the most honest trading book of the last decade. Peter tracks recent trials and tribulations on his path to success dating back to the 1980s. He shares numerous insights into the emotional and technical challenges of trading, right down to his track record over the years. Peter candidly documents a recent trading period. His ultimate success reflects the importance of staying true to a process while still allowing flexibility to modify rules as market conditions change. Anyone desiring longevity in the business really needs to read this book." - Linda Raschke, trader, President of LBRGroup, Inc., and co-author of the best selling book, Street Smarts-High Probability Short Term Trading Strategies. "Almost every book about trading for a living is either fraudulent or boring (or both). This book is neither. Not only is it a good read for anyone seriously wanting to know what trading is really like, it is also very interesting, mostly due to its real-time, diary format. As someone who has done myself what he describes, I highly recommend it." "Trading is not what most people think it is, as you will find out in this real life experience from Peter Brandt, a well-seasoned trader. You will learn what he looks for in trades, what tells him to hop aboard and how to get out. Well worth reading!" "Anyone interested in trading---and not just commodity trading---is going to cherish this book. In a world that tends to become intoxicated with "magic formulas" Peter Brandt provides the necessary sobering balance: the "secret," if there is any such thing, is in recognizing your basic human weaknesses and strengths and working with them, in the context of some relatively simple rules that are effective if you are persistent. The light that Brandt shines on the inner monologue of trading is of incalculable value. There are many ways to extract profits from the markets, but none of them matter if you can't control yourself---for that we need self recognition and self analysis: Brandt's detailed diary is like a great novel, revealing the inner life and character of a trader, revealing the kinds of inner understanding we all need if we hope to navigate an ultimately unknowable future. Traders would do well to try to become, as individuals, more like Peter Brandt." "Mr. Brandt takes the reader far beyond mere descriptions of classical trading patterns. His book offers insights, observations and practical information gleaned from over two decades of consistently successful trading performance. A must read for anyone wishing to enter the world of risk." "Peter provides a fascinating real-world look at commodity trading. This book is a must read for anyone who contemplates being an effective trader. His exquisite use of charting techniques is spot on. And, of course we could not agree with him more regarding the importance of charts in the trader's perspective." - Eero Pikat, President, Barchart.com, Inc.
"A great book for advanced and beginning traders! The professional trading insights that Peter shares can help traders speed up the progress of their own trading by light years." 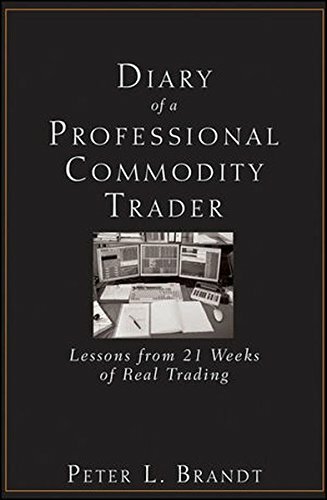 In Diary of a Professional Commodity Trader, Peter Brandt provides a play-by-play diary of his 2009 trading, offering an inside look at the difficult process and what it takes to excel at such a demanding endeavor. A long-time trader, Brandt clearly explains his thinking as he searches for the right opportunities and executes trades for 21 weeks. And by utilizing a diary format, he reveals exactly what it's like to trade, communicating the uncertainty that surrounds every trade and the discipline required to make tough decisions in the face of losing money. Along the way, Brandt touches upon his philosophy on speculation, market analysis, trade identification and selection, risk management, and much more. Unlike most trading books, which tell people how to trade, this reliable guide will reveal the reality of this discipline and provide you with a firm understanding of what it takes to make it work. To what do you attribute your long-term success as a trader? The irony is that in real time, I never fully feel like I am trading successfully because I am always aiming for performance that is higher than I am attaining. I am generally my own worst critic and constantly set the bar higher than my last jump. The result is that it is difficult for me to crow about the “successes” of my trading career. But, to the degree I have been consistently successful through the years, I believe it is due to three factors. First, I am obsessed with risk management. I spend more time and mental energy focusing on risk control protocols than on anything else. Managing losses and losing periods is my number one priority. If I can just tread water during the inevitable tough periods, sooner or later I will find myself caught in a favorable tide. Second, my trading approach is overly simple by design. The result is that I know with as much certainty as is possible with a discretionary approach when there is a trade entry in my program. It does not mean that the trade will be profitable – only that the trade is there. Third, I have tried to engage market speculation systematically, breaking down the process of trading into every conceivable component. What flows from this is an understanding of what components of trading are controllable and measurable and what components are uncontrollable. By the way, whether the next trade or series of trades will be profitable is not a controllable factor. Once a trader learns this -- it is then possible to remove ego from the equation. Why do you think the majority of traders struggle? It is not just the majority of traders who struggle – the reality is that ALL traders struggle, both professional traders and novice traders – but the struggles for each group are of a different variety. The struggles (perhaps the word “challenges” is a better description) of the professional trader are with minimizing asset volatility, handing the mental dimensions of drawdown periods and doing what he or she knows he must do to be successful (the upstream swim against human nature). Novice traders struggle, at least for a couple of years, in the same way a dog struggles to catch its own tail – always chasing it, never catching it! The struggle comes from playing a game without knowing the rules. More specifically, I think that most of the problems faced by novice traders originate from three sources. First, novice traders place a priority on finding winning trades rather than on managing losing trades. The difference between the two things is enormous. Novice traders bring to the markets an ego urge to be right on every trade. This often leads them on a never-ending search for a magic combination of technical indicators in order to be right 80% of the time. Second, novice traders employ leverage that is dooming. Whereas professional traders seldom risk more than a few percent of capital on each trading event, novice traders may risk five, 10 or even 20 percent of trading capital on a trade. Third, most novice traders have not determined exactly what a trading event is for them. If the practical definition and components of a trade are not clearly understood, then it is impossible to develop patience, discipline, trading processes, performance metrics and feedback loops. The exact process a trader employs can evolve and change over time, but there must be a definable starting point. Unfortunately, the majority of novice traders run out of trading capital or hope before they figure out the rules of the game. Why do you prefer pure price-based analysis versus technical indicators? I need to give ample credit to those traders who successfully use technical indicators. I know and respect a number of traders who make heavy use of indicators. But for me, I have no time for technical indicators for a number of reasons. Mainly, my problem is that technical indicators are nothing more than a derivative of price. When I can study price directly on a bar chart – and it is price that I must trade – then why would I want to study a derivative of price. For example, I trade gold – there is no market for trading the stochastic measures or relative strength index of gold. Second, I am a minimalist. I want my trading plan to be a simple as possible. Indicators would have a way of complicating my trading plan. Third – and not finally, because I could go on and on about this subject – reliance on technical indicators can be counter productive. For example, the most profitable bull markets are those that become and remain obscenely overbought. So, the traditional use of RSI and stochastics can predispose a trader to the wrong side of a massive price trend. Again, I honor those traders who make money with technical indicators, but as a general rule I think the “indicator industry” is a sham. Do you have strict rules for taking losses and profits? Absolutely! Positively! Yes! Without Question! No doubt about it! At the time I enter a trade I know precisely what price (or set-up) will result in the trade being closed, for a profit or for a loss. To put a trade on without knowing these things is simply insane. What advice would you give aspiring traders? My initial advice would be to tell them to forget the idea. I would recommend against becoming a trader. Trading is hard work. I would suggest that they give their capital to a professional trader with a history of very small drawdowns. 1. It takes a minimum of two years to learn enough to put real skin into the game. Trade a simulated account in the meantime. 2. Don’t take specific trading advice from anyone under any circumstance. 3. Don’t take general advice on trading concepts or themes from anyone who cannot produce an actual track record of successful trading. 4. The overwhelming majority of books and seminars on trading are a deterrent to success trading. 5. No two successful traders trade the same way – and every successful trader has developed a style unique to his or her own personality, risk tolerance and skill sets. 6. The markets are a great teacher. Be prepared to confront character traits you didn’t know you had. 7. Your opponent to successful trading is not the markets nor other traders, but yourself. 8. Understand that there is no magic bullet – or holy grail. Successful trading is a result of hard work. 9. Have realistic expectations. Traders who think they can turn $10,000 into a million will likely fail. Most really successful traders average around 30% annually on proprietary funds. 10. If, after a year or two, you find that you are not enjoying the voyage, jump ship immediately.